Owner David Rossi began crafting wine at home well over ten years ago and his success in amateur winemaking competitions led him to launch Fulcrum Wines. His wife, Christinna, assists David with sales and contributes another palate to blending decisions. David has an admirable philosophy: produce wines that are balanced and age-worthy. A fulcrum is a point of balance for a lever and his goal is to leverage the best wine out of the best grapes while maintaining balance. He crafts his wines at Crushpad’s modern urban winery in San Francisco. David has a background in food marketing and it shows in the classy presentation of his wines. Each bottle is carefully wrapped in tissue and encased in a paper collar that has a seal depicting an acrobat juggling. This image embodies David’s guiding theme of balance. Six bottles are presented in a handsomely engraved wood box that is very impressive. Of course. it is the wine in the bottle that really matters, but careful attention to outwardly appearance of the bottle and label is often a sign of meticulous attention in the winery. The 2008 vintage of Fulcrum wines brings a new brand at a value price, a change in vineyard name on one bottling, and the addition of a new vineyard source, the Tina Marie Vineyard in the Green Valley of Russian River Valley. Because the 2008 vintage was a warm growing season in Sonoma, the Gap’s Crown and Tina Marie bottlings have riper flavors and slightly more alcohol. The alcohol is more moderate in the On Point bottling from the Santa Lucia Highlands where the heat was not as pronounced. As you know, 2008 in the Anderson Valley was a nightmare. Low rainfall over the winter was followed by frosts in the spring, and then catastrophic fires in the summer. The Anderson Valley bottling is very limited (75 cases) due to low crop yields caused by frost. The Fulcrum Pinot Noir from Gap’s Crown Vineyard was previously called Split Rock Pinot Noir. In 2007, the grapes were purchased through a broker who did not have trademark rights to using the vineyard’s name. In 2008, grapes were contracted directly with the owners of Gap’s Crown Vineyard so the use of the property’s proper name is permitted. This new contract allows better control over the farming of the blocks that grapes are sourced from. The On Point bottling follows the trend of many Pinot Noir producers in offering a value-priced alternative brand for consumers who are fans of the winery and winemaking, but are looking for a dependable wine that is easy on the wallet. 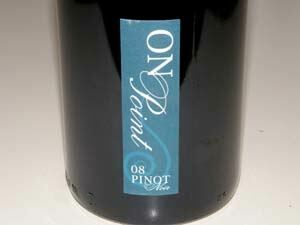 The On Point Santa Lucia Highlands Pinot Noir is intended for those looking for a good Pinot Noir under $30. This is never an easy task, as Rossi insists on making the wine in the same manner as the other Fulcrum wines. The grapes are sourced from Tondre Grapefield and Doctor’s Vineyard, the same grapes that go into vineyard designated Pinot Noirs priced at up to $50 from many producers. The wine is aged in 40% new French Francois Freres oak for 14 months and 6 months of bottle age before release. The On Point name is intended as a tie in for the Fulcrum principal of balance. 13.9% alc., 150 cases, $28, release date May 11, 2010. 86% Tondre Grapefield and 14% Doctor’s Vineyard. Clones 828, 115, 777 and Swan selection. · Aromas of blueberries with minty and green bean notes. Medium bodied with a decent core of darker fruits with a subtle green edge. Picks up some charm in the glass over time, but remains a simple wine. Does not have the powerful fruit intensity that is typical of wines from the Santa Lucia Highlands AVA. Decent. 14.3% alc., 125 cases, $48, release date May 10, 2010. Clones 115, 667 and 777. Aged 14 months in 40% new French oak and 6 months in bottle. · Effusive aromatics featuring mixed berry jam and exotic spices. Creamy in the mouth with discreetly concentrated core of black cherries, raspberries, loamy earth and a touch of citrus lift on the refreshing finish. The tannins are reigned in making for early drinkability. Nicely balanced. Very good. 14.1% alc., 75 cases, $52, release date June 11, 2010. 67% Hein Family Vineyard and 33% Hayley Vineyard. Clones 115 and 777. Aged 14 months in 25% new French oak with additional aging in bottle for 6 months. · A fruity nose featuring creme-de-cassis with a ripe raisiny tone and a hint of alcohol. Moderately rich berry and cherry fruit that is still reserved hidden behind flavors of oak and a strain of herbaceousnecss. Appealingly smooth texture and a dry finish. Good. 14.2% alc., 100 cases, $54, release date June 10, 2010. Clones 777, 828 and 6678. Aged in 50% new French oak for 14 months. · Appealing aromas of fresh dark berries with a hint of forest floor and peat. Full-bodied and juicy, with a mouth coating melange of blackberries and raspberry coulis. The middle palate is rich and penetrating and the finish displays young firm tannins that should resolve. Wines from this vineyard need time to develop and I would give this at least two years in the cellar. Good now but could get better. The small production of Fulcrum wines is sold through a mailing list with limited restaurant and retail accounts. Visit the website at www.fulcrumwines.com.